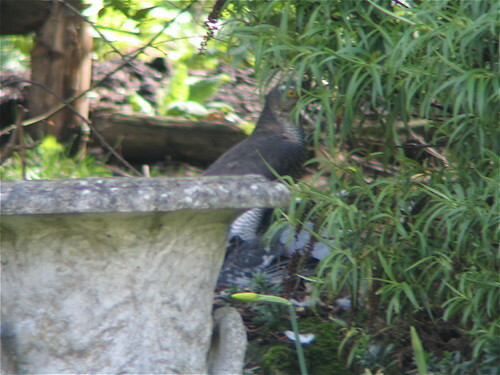 I was absently looking out the window and realised that a bit of a kerfuffle was a sparrowhawk taking one of the pigeons. Female this time, so she’s bigger and browner than the last s/hawk in the garden. By the time I had my scope and camera ready, she dragged the pigeon behind a bush, so she was obcured and the light wasn’t great. But at least the photo is good enough to show she was there. The cat scared her away before she’d finished, and the pigeon flew away too, so there’s a partially plucked pigeon out there somewhere. A pigeon is quite large prey for a sparrowhawk, which is presumably why she didn’t take it very far.